Bruschetta is the perfect appetizer at Italian BBQs. Just think about it: the bread gets grilled straight on the BBQ, garlic and tomatoes are found in every Italian house (especially in the summer) and the same applies for olive oil. It takes little to make it and it’s such a nice and fresh treat to get your stomach ready for the night. At least, it works for me. I’ve been spending at least a part of my summer holidays in Rome for three years now, visiting my boyfriend’s family and friends, and every time someone hosts a BBQ night, bruschetta is always what comes first. And I love it. I am very careful when it comes to cooking with garlic. I like to use it, but in a very moderate way. My mom is the opposite: she is a huge garlic lover and would be able to put garlic in every dish. And we’re not speaking a random clove floating around in the pot: she presses it, so that it releases its taste and smell to the fullest. “Don’t complain, it’s healthy” is her favourite line every time I snap at her that she put too much. I will not deny that garlic is healthy, she’s probably right on that, but I just don’t like it when all you can taste is garlic. And I never got used to the ultimate Polish remedy for the flu: hot milk with garlic and honey. No thanks, I choose flu. Yet, when it comes to bruschetta, I must admit that I can become a little bit like my mom. I like to taste the garlic. It has to be there: no garlic, no bruschetta. When you want garlic to play gentle in your food, you have to cut it. If you want it to release its full flavour, then you press it. On bruschetta, you press it onto your slice of bread. You rub a clove of garlic against toasted bread. Most of it will stay on the bread, but it will be the tiniest layer. And although tiny, that layer of garlic will be prefectly noticeable. What you have on bruschetta is, to me, the essence of how one should deal with garlic: you can take it at its strongest potential, but with moderation. Then it’s good. (No, even with moderation I will never have milk with garlic. Take it back, mom). So the other day for lunch I made myself bruschetta, on Swedish bread. Dark, whole grain, rye bread. I toasted it in my electric toaster, then I rubbed a clove of garlic over it. 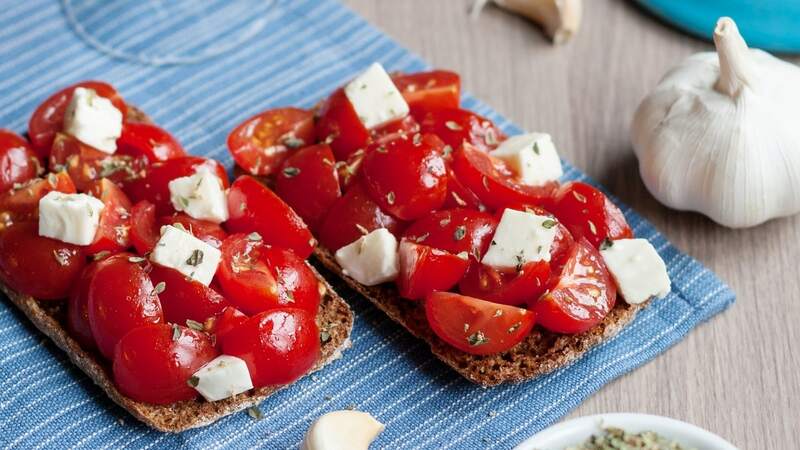 Instead of placing diced tomatoes on top of the bread and then sprinkling it with salt and pouring some olive oil on top, I put my cherry tomatoes (cut in 4) in a bowl and sprinkled them with salt and olive oil. I prefer to have my tomatoes well seasoned and no dripping oil trickling around from the bread. I also added some random pieces of mozzarella here and there, because with the leftover cherry tomatoes I made myself a bowl of tomato and mozzarella salad, so I thought that a little mozzarella would look nice on my bruschetta. Last, a little bit of origano on top of it all. I enjoyed it greatly. Even though there was foggy cold Sweden outside of my window, this thing tasted like summer back home. Nothing more delicious on a summer evening a fresh Italian bruschetta. This looks absolutely delicious, and your photos are so lovely! I am like your mom -lover of garlic 😀 My mom loves it too!